Merry Christmas! I hope all who celebrate enjoyed their day with family, friends, and good food and mirth. I enjoyed my day the same, but my thoughts and prayers continue to be with the families of all those affected by the horrible tragedy at Sandy Hook Elementary School in Newtown, Connecticut. 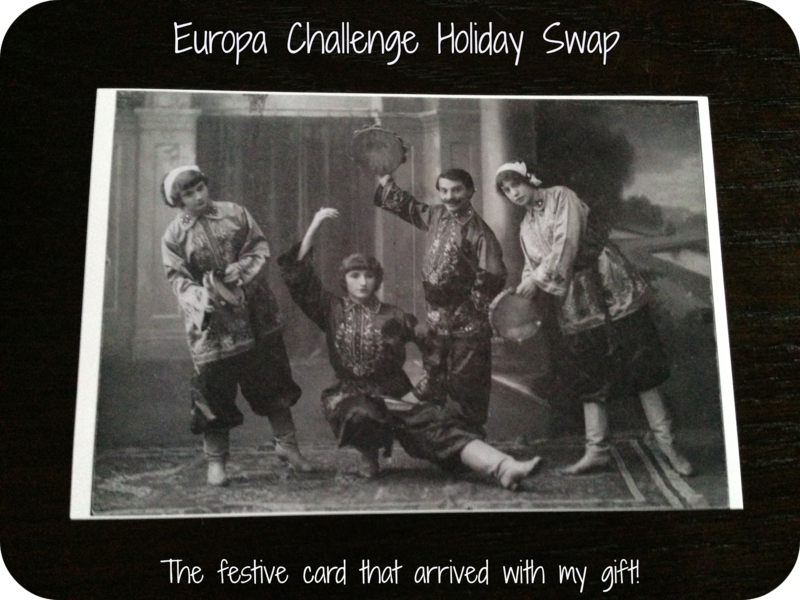 Two months ago, the incomparable Marie from The Boston Bibliophile organized the Europa Challenge Holiday Swap and I immediately signed up. Maria also is the creator and organizer of the Europa Challenge, and with a recent visit to Europa's offices on her trip to Italy, I am beginning to feel the motivation to join the challenge for 2013. I was a bad participant in this year's holiday swap as I somehow missed a pile of packages to be sent out in the first part of December that were hiding in my office, so the recipient of my Europa Holiday gift will find their UPS package today. My apologies to Marie and to Bibliosue for my embarrassing delay. Michael from Vancouver, a documentary filmmaker currently creating a series on art in public spaces, sent me my delightful package and was much more prompt and considerate as I received his gift a few weeks ago with specific instructions to not open until Christmas. As much as I eagerly wanted to open up the package, I minded my manners (very hard for me to do at times) and opened up my gift last night. I had put my list together of options for the swap and was hoping one in the top of the order would be selected so I was thrilled The Nun was selected! 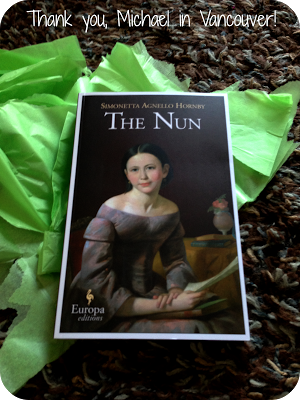 The Nun is written by Simonetta Agnello Hornby and translated from Italian by Antony Shugaar. I cannot wait to dive into the story. Don't these covers selected by Europa Editions just call out to you? The painting is entitled Reflection, and the artist is John Francis (1808-1886). Thank you again, Michael, I so appreciate it. Happy Holidays and New Year to you and all my friends. Here's to a healthy, happy and, most especially, safe 2013. I love the card and hope you love the book! I bet waiting to open it was tough! Looking forward to that one myself; enjoy! Hope had a wonderful Christmas with family and friends. Thanks for taking part in the swap, Natalie! :-) Merry Christmas! I hope you decide to take part in the challenge in 2013- we'd love to have you! I was Michael's Europa Secret Santa so I am glad he sent you a book you will enjoy. Happy 2013 to you and Happy Reading! Europa does have the best covers!